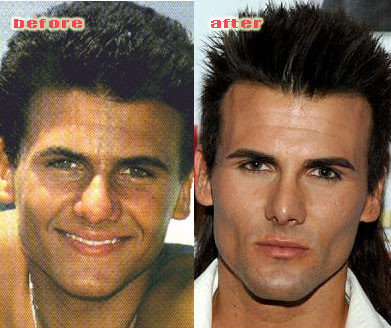 Jeremy Jackson before and after nose job plastic surgery. Many of you probably wont even remember who Jeremy Jackson is, well to refresh your memory, he played the role of Hobie Buchannon (Hoff's son) on the popular television show Baywatch. I think it goes without saying, but Jeremy Jackson has drastically changed his appearance with a major nose job, new hairstyle and dark guyliner. Was this yet another botched nose job or simply good plastic surgery? You be the judge! The nose looks good, but the guyliner is bad.